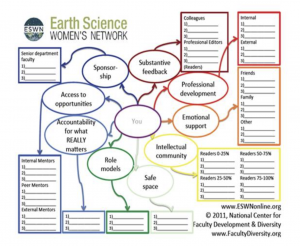 The Earth Science Women’s Network (ESWN) began in 2002 as an informal network of women in the early stages of their careers, with a mission to promote career development, build community, provide opportunities for informal mentoring, and support professional collaborations. Since then, ESWN has grown into a community of over 3,000 members across more than 50 countries, registering as a 501c3 in 2014. ESWN became a member of the 4W project network in 2014. • Portfolio of online and in-person activities, supporting our growing membership of women scientists, as well as men and women in a wide range of STEM disciplines. • Membership in ESWN online communities continues to grow steadily, reaching above 3,000 in 2017. • Organizing workshops, professional development meetings, and networking opportunities for young scientists throughout the year, including a 2017 science communications workshop at George Mason University in D.C. and a portfolio of events at the 2017 American Geophysical Union (AGU) Meeting in New Orleans. • Extending the ESWN peer-mentoring model to first-year undergraduate women, with pilot studies funded by SF in the Front Range (Colorado/Wyoming) and the Carolinas (North and South Carolina), funded by the NSF for five years. • Received a special award from the American Meteorological Society in January 2017 for inspirational commitment to broadening the participation of women in the earth sciences, providing a supportive environment for peer mentoring and professional development. • ESWN Science-A-Thon (#DayofScience) celebrated science and scientists from June 18 to June 22, as participating scientists shared what their daily work is like through pictures and social media. ESWN raised over $32,000 for its ScienceForward Initiative. • Established a $75,000 endowment through the Madison Community Foundation campaign in 2017, including a $25,000 generous MCF matching grant; we are still working to create a $150,000 total endowment in 2018. • In 2017, leaders in the ESWN network, led by Dr. Erika Marín-Spiotta at UW-Madison, reviewed a four-year, $1.1 million grant from the NSF ADVANCE program to increase the participation and advancement of women in academic science and engineering careers, in part by improving work climate conditions to eliminate sexual harassment. • Launching a new initiative, ScienceForward, in 2017, which builds on-ramps for students to engage in STEM through advice, role models, and empowerment, based on best practices from ESWN’s experience. • Advancing work funded by NSF to engage college students in STEM and to combat sexual harassment in science. • Continuing activities to support women in the earth sciences and beyond, including events at the 2018 American Meteorological Society Meeting in Austin, and the 2018 AGU Meeting in Washington, DC. • Participating in the 2nd Annual Science-A-Thon June 18 to 22, 2018. • Aim to raise $50,000 in 2018 to qualify for the remaining $25,000 MCF matching grant, and meet our $150,000 total endowment goal. In January of 2017, the Earth Science Women’s Network received a special award from the American Meteorological Society for inspirational commitment to broadening the participation of women in the Earth sciences, providing a supportive environment for peer mentoring, and professional development. 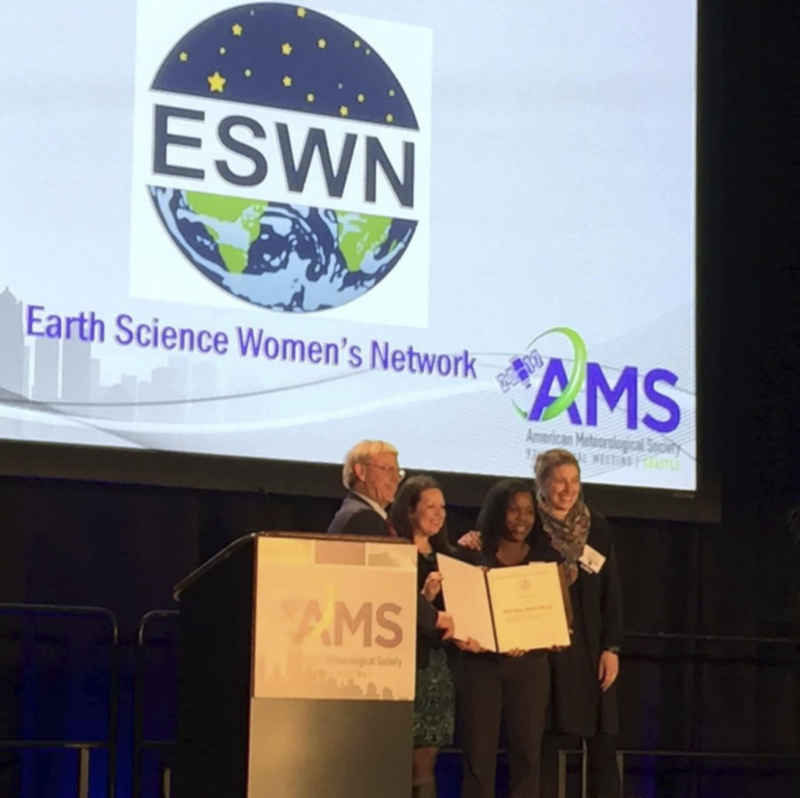 ESWN’s activities “have been shown to remove feelings of isolation and help women in the geosciences overcome barriers to professional advancement.” Thank you to the American Meteorological Society!